Life is a little crazy around the Craftery house this week because my Moose is turning 6. 6 years old, you guys!!! 6 is no longer a tiny kid, but an over 4 foot tall, school-aged, smarty-pants ball of awesome! Anyway, even though I’m in the midst of getting his birthday party together, I didn’t want to wait to share this last quilling paper greenery post. This time, I’m going for more of a rustic, farmhouse vibe and sharing an easy tutorial on making quilling paper eucalyptus and lavender. I didn’t go into any detail on how to do this last time, but the process is very simple. Cut the wire to the length needed for the individual stems and wrap the tape around the wire, overlapping it slightly as you go. The tape doesn’t feel sticky but it will stick to itself as it goes around the wire. Easy peasy. Now, let’s tackle the eucalyptus first. Like some plants, eucalyptus can have a few different shapes, but I chose to make the most recognizable type, the true blue. The true blue eucalyptus features pairs of flat leaves growing side by side up a single stem. I made the leaves by rolling extra long strips of deep leaf green quilling paper into a tight coil. To make yours the same size, try gluing 2 22″ strips together, or 2 1/2 17″ strips. Once each coil is rolled, remove them from your quilling tool and let it unravel very, very slightly, while still holding it between your fingers. This will allow the center to open up just a tiny bit. Glue the end to keep the coil in shape. To make the eucalyptus leaf, pinch one end of the coil into a teardrop. Then pinch the other end gently between both hands, being careful not to squeeze too hard. You’re not looking to making two more points, but more of a flattened heart shape. Letting the coil unravel a tiny bit allows it to be shaped a little easier. Each eucalyptus stem will need quite a few of these leaves. The smallest stem I made used 10 leaves. This might be one of those situations where you decide to pick up a battery operated quilling tool. It really will come in handy here. After all the leaves are made, they can be added to the stems. TIP: Think about using hot glue, so you don’t have to hold each leaf as it dries! Each pair of leaves can be glued about a half an inch apart on the stem. To keep a natural look, have all the leaves facing the same way, but allow them to twist on the stem a little bit. A lavender plant can be easily spotted by its many, many small buds sprouting from a long stem. Quilled lavender buds can be made by simply rolling 1-inch strips of light purple quilling paper into tight coils, or pegs. 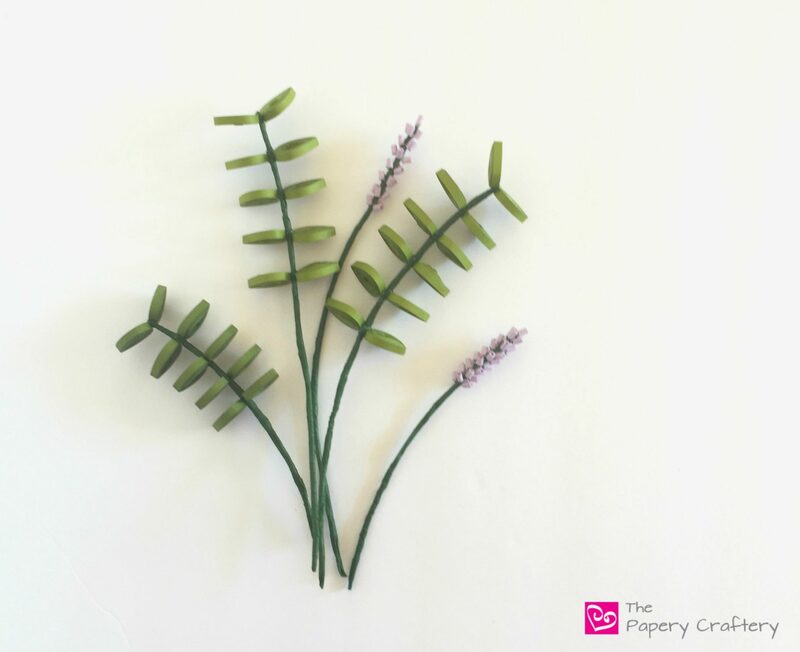 The lavender buds can be glued directly onto the wire stems. I started with one at the very top. Then, I continued, making rows of 4 buds in a circle around the stem. I’ll be totally honest and let you know that I made a pretty nice mess trying to use hot glue to stick lavender buds to a stem. It got really gloppy and was just not working. I ended up dipping the edge of each bud in some Tacky Glue, then holding them against the stem for a few seconds until they stayed in place. Try to have your buds angled away from the stem to aid in the look that they’re sprouting out. Each lavender stem that I made has 8 or 9 rows of buds. I love the mix of sturdy eucalyptus leaves mixed with delicate lavender flowers! Try wrapping a few of each stem with some lacy ribbon! I think I might try adding a drop or two of eucalyptus and lavender essential oil so they can smell as real as they look! I have some plans for these quilling paper eucalyptus and lavender stems. I’ll share that post in a couple weeks! In the meantime, I hope you’ll give this tutorial a try. Gives me a great idea! I’ve kinda been on a rock-painting “binge” but I have a nice large flat rock that I may try to incorporate the eucalyptus and lavender with tacky glue. of course it will have to be an indoor decoration (most of my painted rocks end up in the garden) I just got a coupon from JoAnn so it was an omen! hahahaha Have a great day, and HAPPY 6th BIRTHDAY, MOOSE! So glad to inspire some new quilling/ painted rock mash-up for you, Gerri! And I’ll pass along the kind wishes to my guy! I am enjoying your posts so very much ! You give clear instructions ! I have been a quiller for over 40 years ! That’s so wonderful to hear, Lois! I really appreciate it. I’m sure with your experience you can teach me a thing or two about quilling. And with 2 little ones running around here, I have nothing but absolute respect for all teachers! So nice to meet you! Is there some way to print the instructions besides using ctrl P? If I do that it’s 8 pages. I would appreciate a print key like pinterest and facebook that would condense the instructions. Love you tutorials!!! Thanks for helping us along on the journey of quilling.